Let’s start with the basics. What kinds of pesticides are there? When it comes to food, herbicides, insecticides, and fungicides are the most commonly used. Herbicides are used to control the growth of unwanted weeds; insecticides are used to control insects and other bugs that could damage and infect food crops, and fungicides are used to prevent the growth of mould and keep food from rotting. So why are pesticides used? They protect crops from rotting or being eaten by insects or infected by pests. By doing this they significantly increase the yield per growing season and reduce the risk of unsafe bacteria on our food. But are pesticides really safe, or should we be eating organic fruit and vegetables only? The Canadian Food Inspection Agency (CFIA) strictly regulates the use of pesticides and has maximum residue limits for fruit and vegetables. Most fruit and vegetables remain below the allowable limits, which themselves are well below the level that could cause harm. CIFA does take the use of pesticides seriously and does extensive testing to ensure that the amounts of pesticides that end up on our food is not a danger to us. Pesticides break down over time through exposure to sunlight, water and air; leaving significantly reduced quantity on produce. On fruits that can’t be peeled, washing the outside does remove the majority of remaining chemicals. However, if pesticides are on your mind, there are some fruits and vegetables that are considered to contain the least amount of pesticides, in the form of a list, published by EWG. These are called the “Clean 15”. This list includes fruits and vegetables such as corn, pineapple, avocados, cabbage and onions; because they generally have properties that naturally repel the threats of insects. On the flip side of that, EWG also publishes a list of something called the “Dirty Dozen” which is a list of 12 fruits and vegetables that are considered to have the most amount of pesticides, compared to all other fruits and vegetables. Produce such as strawberries, spinach, nectarines and apples are considered to have among the highest content of pesticides. Some people argue that EWG is doing a disservice to people and their health, because it’s dissuading people from eating the fruit and vegetables that they need. Not to mention that it’s causing people to avoid the “Dirty Dozen” and only causing more of these fruits and vegetables to go to waste. 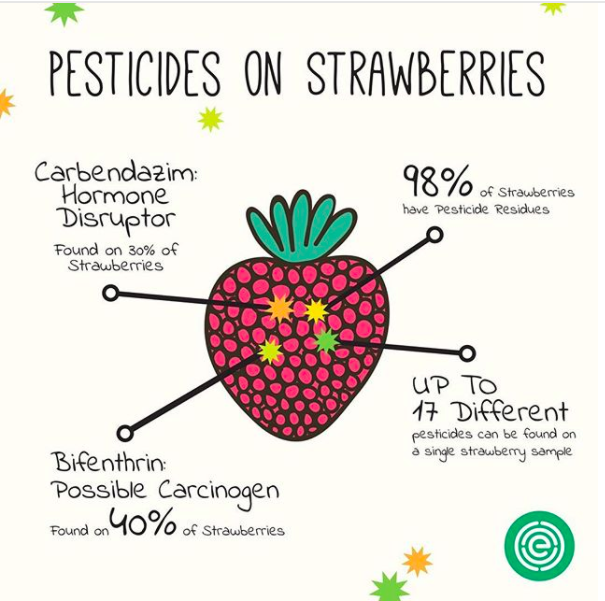 And while hearing that strawberries are on the top of the Dirty Dozen list is scary, a child can eat 1500 strawberries per day and not experience any negative effects from pesticide residue. The US Department of Agriculture tested 10,000 food samples across 10 states and found only 0.5% that were over the allowable limit. At the same time 15% of the tests show no traces of pesticide residue at all. Overall, the benefits of eating fruits and vegetables are the most important thing to remember. Several servings a day can lower the risk of cancer and heart disease and its pesticides that, in part, make it possible for them to be available to everyone. What are your thoughts on this topic? Do you think pesticides are safe to use and help in the production of food, or do you think it’s doing more harm than good?